Ryan McClure – I have that power. This post is part of a meta-series. Click here for a list of all posts in this series. Hey, remember this project? This project that I haven’t much talked about in the last, oh, nine months or so? Guess what! I just finished assembling the high-detail paper model for the base mold! I did indeed switch to using hot glue after my last update, to excellent effect. Rather than applying it via a hot glue gun, I instead used the glue gun to keep the glue in a liquid state and spot-applied it with toothpicks. This worked out really well, with one giant downside that I didn’t recognize until the damage had been done: leaving hot glue to just sit there with heat on it results in some of it vaporizing. My office, where I’ve been assembling this, is not well-ventilated. As a result, once I realized why I had started coughing and feeling miserable, I shelved the project for a bit. 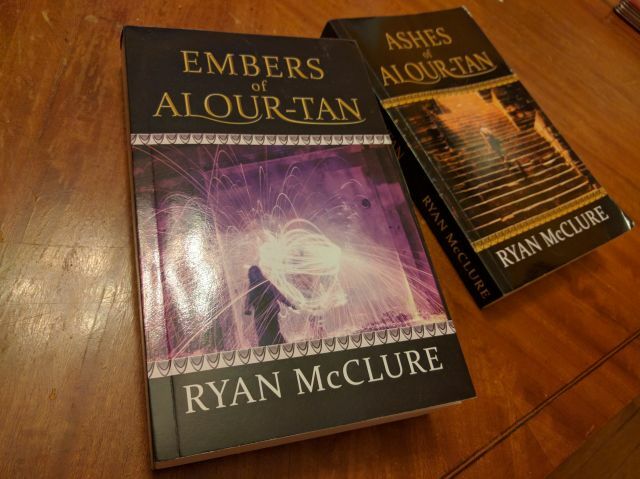 Also, finishing Embers and running a D&D game for some friends took over my life for a little while, but Embers is now out1 and I’m finally getting a handle on balancing my prep work for the D&D game, which means time to work on this has materialized once more! No doubt spurred into action by seeing Rogue One, I dove head-first back to work. This time, I kept a fan running at all times and wore a simple dust mask, which prevented most of the fumes from getting anywhere near me. I also purchased the fellow pictured here on clearance at Target to keep me company while I worked. Everything has come together exceedingly well, as far as I’m concerned. I hit on the idea of creating small little cardboard cross-section supports, hearkening back to my original design approach to this whole project. I noticed some structural deformation happening to the cardstock due to the growing weight of the model. Given that forestalling this kind of warping with the resin and fiberglass step is the next part of the plan, I didn’t want to go into that step with an already-warped model! I looked over the major distortion points and created simple planes intersecting the helmet model in Blender, then printed these out with the paper model plugin the same way I had everything else so far. I rummaged around in the basement for a cardboard box of the approximate right dimensions and sturdiness and then got to work slicing these up and gluing them into place. I used a green marker to identify the vertex attachment points on the physical model that corresponded with the origin locations for the planes on the 3D model. Turned out as well as I hoped! Here’s the completed helmet beside its prototype ancestors. The massive size of the original prototype doesn’t really come across in this picture due to perspective, but it dwarfs both the small sizing prototype and the full-resolution model. With ventilation now prominent in my mind and knowing that my next step involves resin and fiberglass, I need to resolve the workspace air quality issue. It’s the middle of winter, so working outside just isn’t an option. Fortunately, I have a solution that’s been waiting for me to realize it exists for over seven years: the small, unused, vaguely creepy basement side room beneath the sun room. I can’t realistically ventilate the entire house-length basement to the degree I’d need to for working with resin, but that little room is its own space with its own window. Getting enough airflow to keep it well-circulated is easily within reach of a hardware store ventilation fan and some dryer vent tubing to direct the fan’s airflow out the window. Making those modifications to this proto-workshop is my next step. I’ve also started formulating concrete plans for the vacuform table I want to build to manufacture the rest of the armor, which I’ll try to post more about in the coming days and weeks. Been quiet on the stormtrooper front of late, but it’s still coming along!